Galion’s Arby Thompson tries to break free from a tackler during the first half of the North Central Ohio Football Coaches Association All-Star Football Classic on Saturday at Lexington High School. The blue-shirted North All-Stars won the game, 30-8. 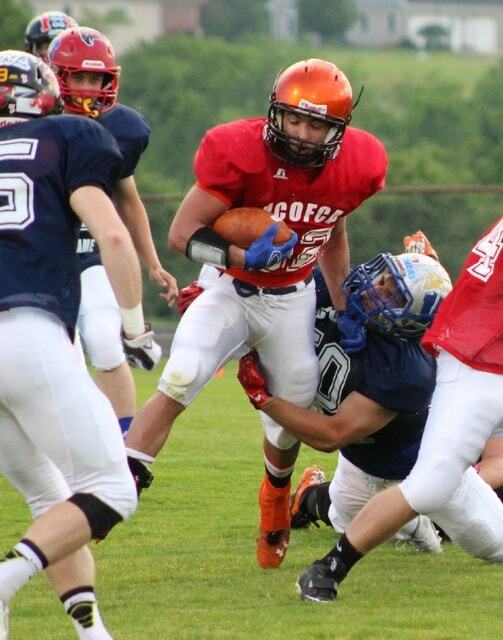 LEXINGTON — Ashland’s Tyler Wilson returned two interceptions for touchdowns to pace the North All-Stars to a 30-8 victory over the South in the 2015 North Central Ohio Football Coaches Association All-Star Football Classic on Saturday at Lexington High School. After a lackluster first half that ended scoreless, the North finally broke the ice when Plymouth wide receiver Tyrell Edmiston caught a 75-yard scoring pass from teammate Hunter Bailey to give the blue shirts a 6-0 lead with 4:22 remaining in the third period. Prior to the North touchdown, it appeared the South would be the first to score after driving to the North 9-yard line. However, Mansfield Senior running back Ricky Minor fumbled to give the ball back to the North and set up the scoring drive. The South put together another solid drive on its next possession. Mount Gilead’s Joseph Elson caught a 26-yard pass and Colonel Crawford’s Dylan Gulley made a 7-yard catch to help the red shirts move the ball inside the North 20. But that’s when Wilson made his presence known in the game. The Ashland defensive back stepped in front of a pass by South Central quarterback Jacob Carney at the 1 and returned it 99 yards for a touchdown to increase the North lead to 13-0 with 52 seconds left in the third period. North defensive back Cole Hollis of Bucyrus snuffed out the next South drive, intercepting a Carney pass and returning the ball to the South 44. Running back Juwan Howard then exploded for a 44-yard touchdown sprint to extend the North advantage to 20-0 with 11:45 left in the fourth quarter. Twenty seconds later, Wilson stepped in front of another Carney pass, this time taking the ball 51 yards for a touchdown and a 27-0 North lead with 11:25 to play in the game. Wilson was named the defensive most vaulable player for his pair of pick sixes. Tiffin Calvert placekicker Michael Smith connected on a 27-yard field goal with 4:51 to play to round out the scoring for the North, and give the blue shirts a 30-0 cushion. The South avoided the shoutout at the 3:52 mark when Mount Gilead’s Joseph Elson snagged a pass from Mansfield Senior’s Assante Wilder and sprinted 86 yards for a touchdown. Wilder converted the 2-point run. Neither Elson nor Lane Foster of Northmor, who each rushed for more than 1,100 yards during the 2014 season, were used at running back in the all-star game. Galion teammates Arby Thompson and Jermaine Burket said they enjoyed having the chance to suit up for the same team one last time. At halftime of the game, a placekicking contest was held and Galion’s Connor Moreton connected on a 50-yard kick to win the event. He will be a junior for the Tigers this fall. Scholarships were awarded to 14 student-athletes at the all-star banquet held on Friday evening at the Der Dutchman Restaurant in Bellville. Following is the list of scholarship recipients: Jacob Carney, South Central; Colton Harvey, Shelby; Tyler Ruhl, Fredericktown; Matthew Davidson, Norwalk; Matthew McDaniel, East Knox; Cole Murtiff, Bucyrus; Lane Foster, Northmor; Byron Bailey, Plymouth; Alex Hill, Madison; Elliott Rhodes, Norwalk; Ethan Shultz, Danville; Dalton Dennison, Lucas; Tristan Bender, Loudonville; Josh Hassman, Lexington.